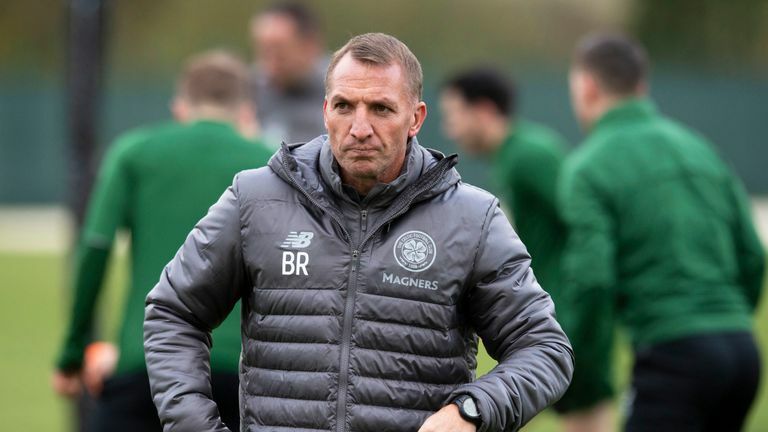 Celtic boss Brendan Rodgers says managers need to be protected in the wake of his Hibernian counterpart Neil Lennon being struck by an object thrown from the crowd. Lennon was hit during the Edinburgh derby on Wednesday after he had celebrated when Hearts had a late goal disallowed. When asked about the incident, Rodgers said: "You come into a football pitch, you're in to do a professional job. "You want the intensity, the passion, but you have to be protected as a player and a manager in that environment. "It's not nice when you see a fellow manager get hit. Up here the passion for football is fantastic. You go to these grounds and there's a real intense atmosphere at a lot of them, but it can never spill over. "To see that was obviously disappointing. No matter how intense it is, it has to be a safe environment for you to go and do your work. "The respective clubs, in fairness, have come out with their statement, which shows their togetherness on it, and hopefully it won't happen again. "Ultimately you have to be able to work without the threat of being hit." Lennon says he may consider his position as Hibernian head coach following the incident, adding he regularly suffers sectarian abuse as an Irish Catholic who both played for and managed Celtic. Asked about Lennon's comments, Rodgers - who is Northern Irish and also a Catholic - said: "It's not something I really want to go into. "Whatever your religion, wherever you're from and whatever your personality is as a manager, it doesn't matter. You shouldn't be subject to that. It's irrelevant. "But I'm sure authorities and everyone will try and improve on that because it's not an image of the game we would want up here. I've been up here two-and-a-half years and it's been a brilliant place to work and live. "There's really authentic people here [who are] very passionate about the game. I've loved my life up here. But of course it can't overstep the mark."